Since Navajo National Monument is so peaceful and quiet, I stayed on the morning of October 7, 2009 to enjoy the otherwise empty campground. It was over two hundred miles to my next destination, at Moab, Utah. In order to visit all my favorite places along the way, I would have to stretch geodetic verisimilitude. Today, my intention was to see it all and still be in my Moab camp before the sun descended behind the Moab Rim. I stopped first in Kayenta, Arizona, a city within the Navajo Indian Reservation, or “Res”, as the locals call it. 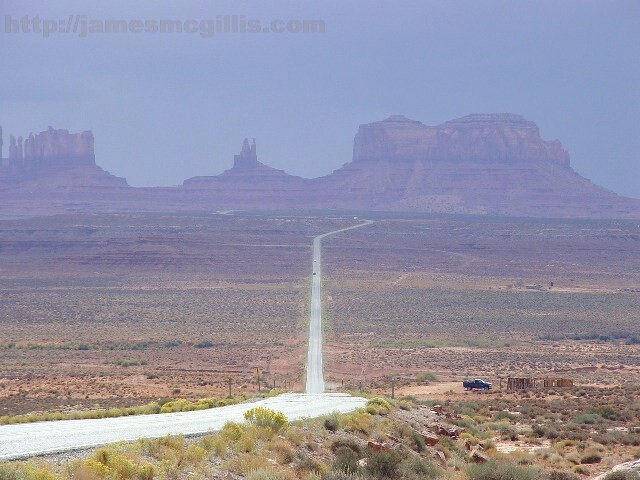 Kayenta is also the southern gateway to Monument Valley, via US-163 Scenic Highway. 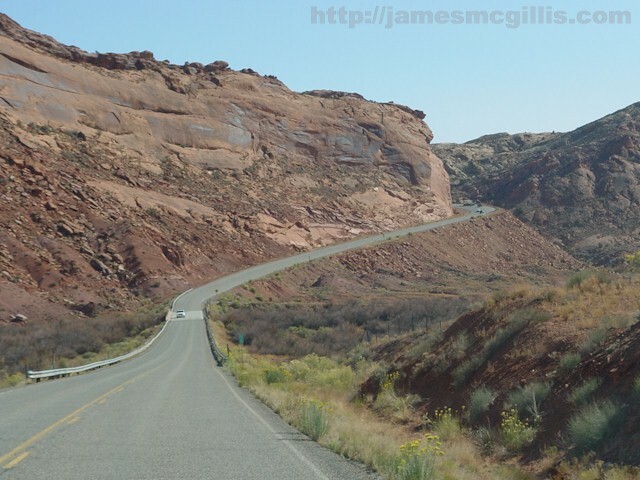 While US Highway 191 North will get you to Bluff faster, it is a bone-jarring road through unredeemed scenery. Every time I go the fast way, I wish I hadn't. Passing through Monument Valley is now my right of passage to the Four Corners and the High Southwest. Other than an Anglo insurance adjuster assisting a local resident, everyone I saw there was Navajo, or Dine’, as they call themselves. Although Navajo facial features differ from those we might see elsewhere, the youth of Kayenta wore attire indistinguishable from their suburban brethren across the country. While visiting Kayenta in June 2009, I located a field north of town from which emanated the vortex of a regional dust storm. 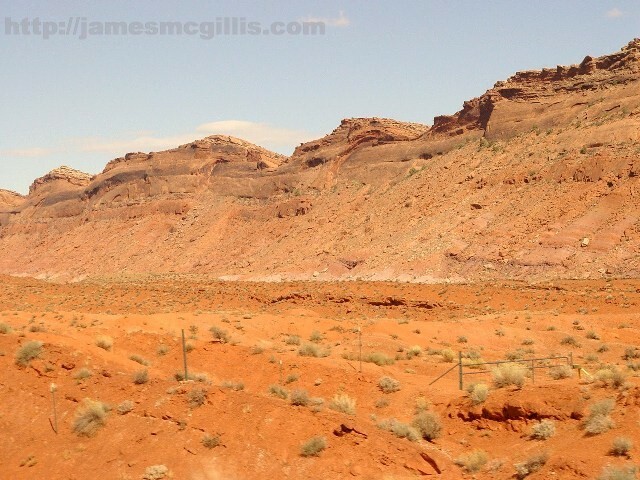 Driving south towards Kayenta that day, I traced the point of origin to a field across Highway 163 from Chaistla Butte. I was amazed to find that a dust storm covering hundreds of square miles could have its origin in one empty field. Ten minutes later, in Monument Valley, I observed ongoing destruction of the landscape. Along Highway 163, several dogs herded a flock of sheep southward toward that fateful field. With no humans in sight, the dogs kept the sheep moving down that parched valley. As it is today, when ancestral Puebloan Indians first inhabited Monument Valley, there was no year-round running stream. 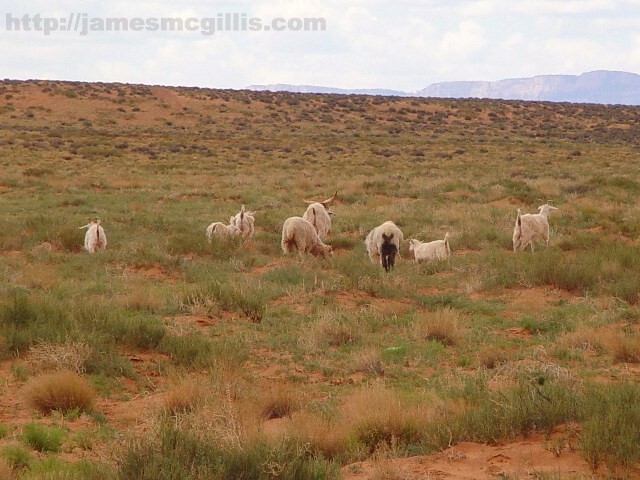 For over one hundred years, Anglo ranchers’ sacred cattle and the Navajo’s sacred sheep have eaten the West. Left unchecked, sheep will eat low lying plants down to their roots. One needs to look no farther than the fence lines along Arizona highways to see the damage. When compared to the overgrazed landscape of the open range, the protected area along the roadside is lush with vegetation. Shifting sand and blowing dust have been part of their lives for so long; locals of all ethnicity now take it their moving landscape for granted. 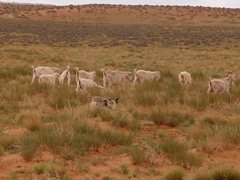 With an extended dry cycle in the West, we must control and curtail grazing in wind-sensitive areas. Allowing further destruction and dissipation of the land will encourage even earlier seasonal dust storms, with attendant early snow-melt in the high country. The issue no longer centers on sacred grazing rites or cattle ranching traditions. Now, the issue is the survival of the Western landscape and all of us who live or play within it. Only when all humans abandon their sense of entitlement will this endangered land begin to heal itself. On this October day, a cold front had cleared the air in the Four Corners region. As I approached Monument Valley from the south, I caught a glimpse of the Abajo Mountains, over seventy miles to the north. Before reaching those mountains later that afternoon, I would cross the Arizona - Utah border in Monument Valley, then on through the towns of Mexican Hat, Bluff and Blanding. During my 1965 visit to Monument Valley, I had discovered a favorite scene. Now heading north, capturing that scene required me to stop and look back. From a mesa top, I had a long view toward the buttes and spires of Monument Valley. Here, the movie character Forest Gump stopped running and returned home. Over forty years after my first visit, the spot was just as majestic and unspoiled as it was in my youth. After departing Monument Valley, I traveled across a narrow bridge that spans the San Juan River. 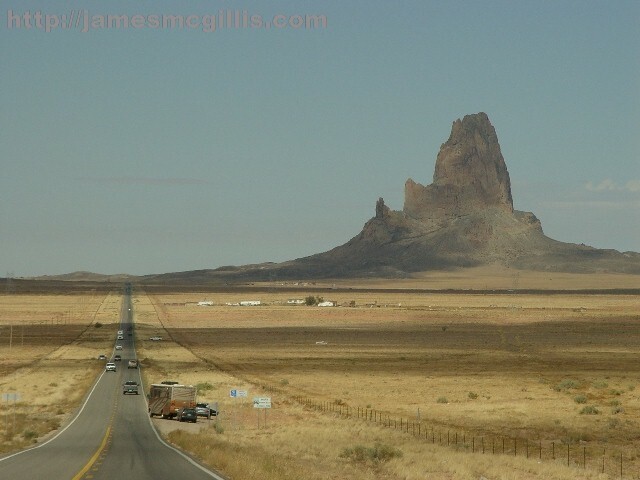 There, serving as the northern gateway to Monument Valley is the town of Mexican Hat, Utah. 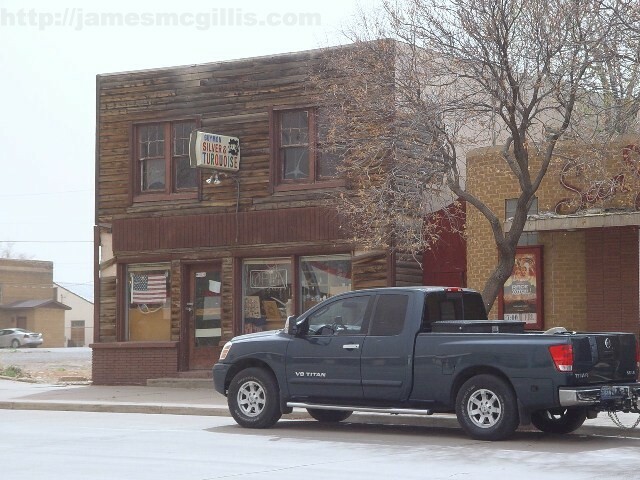 Home to about one hundred hearty souls, it was there; in a roadside diner, that author Edward Abbey set the scene for the climactic chase in his 1975 novel, The Monkey Wrench Gang. 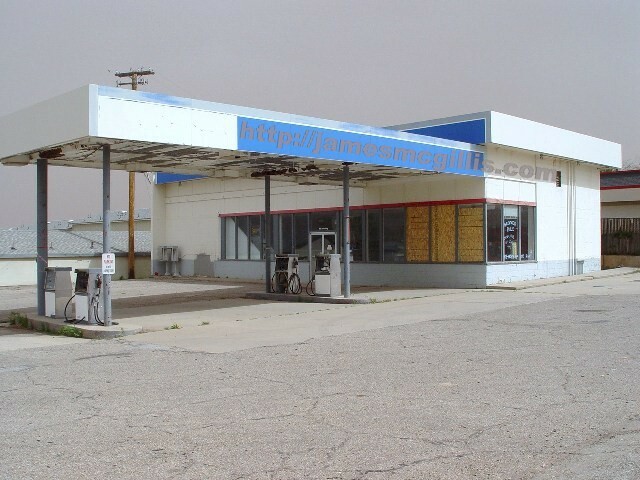 Since Abbey set his scenes with geographical accuracy, a now abandoned diner In Mexican Hat may have served as his model. 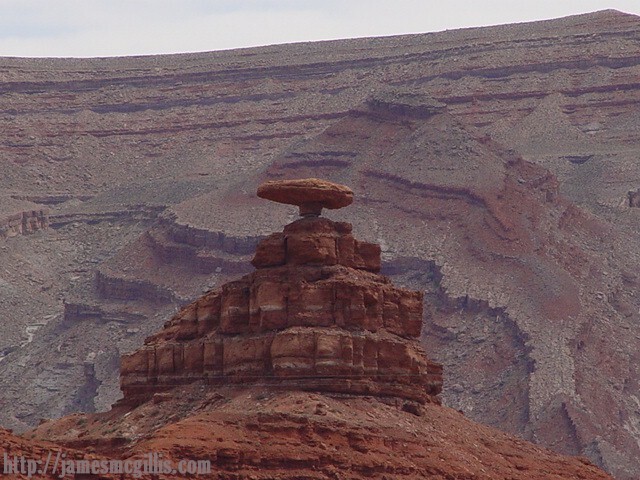 The actual Mexican Hat Rock is a disk of sandstone sixty feet in diameter. Perched as it is on a much smaller boulder, one must invert the image to see the hat. In the background, stand convoluted and eroded landforms of fantastic proportions. With only the San Juan River to carry away the products of erosion, one can only imagine how many thunderstorms in the desert it took to create such fanciful shapes. The next Utah landform of note I encountered was Comb Ridge. The large, tilted-block monocline divides much of Southeastern Utah along a north – south axis. Named for its resemblance to a cockscomb, one can see how the eroded ridge top inspired such a name. Approaching Comb Ridge from the south, the highway first crosses Comb Wash. With the ridge of eroding sandstone looming above, the Highway 163 climbs over the steep ridge. Partially because of space constraints, highway engineers gave us a strong running start down into the wash then up through a dramatic road cut. From plateau top to the bottom of the wash and then to ridge top again takes less than two minutes. With its changes in elevation, swooping turns and potential for falling rocks, the short transit up and over Comb Ridge is both dramatic and memorable. Heading north from Comb Ridge, Highway 163 briefly shares a route with U.S. Highway 191. In the town of Bluff, beneath sugarcoated sandstone canyon walls, the two highways again diverge. There, at a T-shaped intersection stands a remnant from the past known as the old Cow Canyon Trading Post. 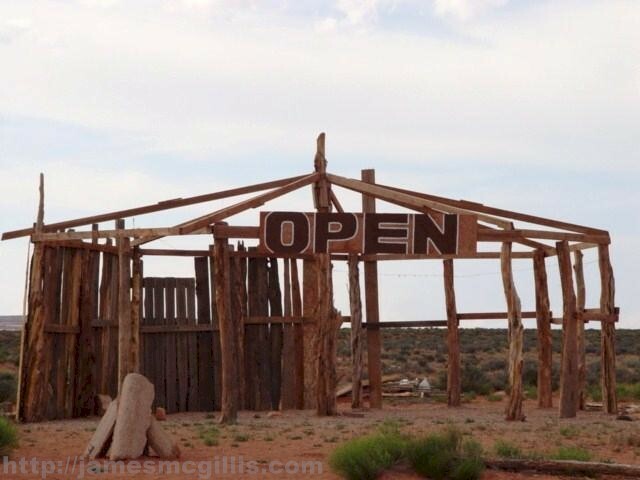 Since images of the old trading post serve as “Moab Ranch” in my online novel at JimMcGillis.com, I stopped to look around. 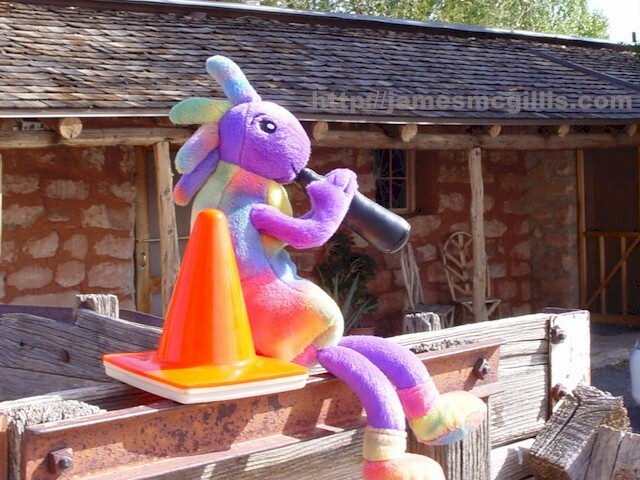 A rustic buckboard at that location provided a backdrop for pictures of Kokopelli and Coney, two of the characters in my novel. My next stop was in Blanding, Utah. As did Bluff to its south and Monticello to its north, Blanding began as a Mormon outpost and settlement in the late 1800s. Today, Blanding’s simple, clean appearance belies the angst and anguishes many of its longtime residents feel. The collecting of ancient Indian artifacts, locally called “pot hunting” has been illegal on public lands since President Theodore Roosevelt signed the Antiquities Act of 1906. 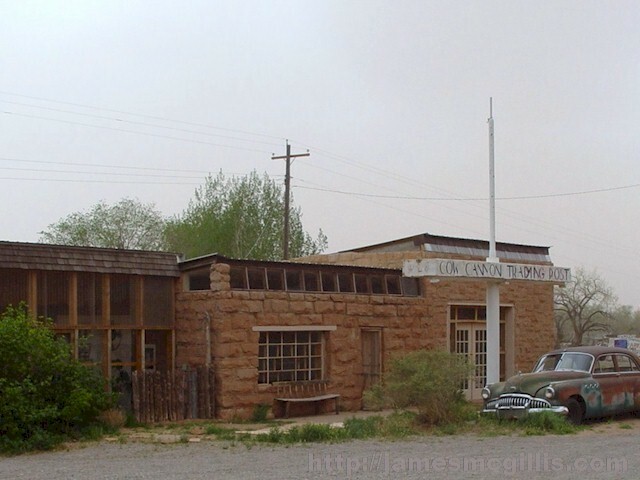 In the 1980s, arrests and prosecutions of several prominent local citizens had curtailed, but not ended the looting in San Juan County. The arrest of twenty-six Four Corners residents in early 2009 indicates that looting of artifacts from graves is still considered by some to be an “entitlement activity”. If Ute Indians from the White Mesa Reservation were to dig up the Blanding City Cemetery in search of valuables, would townsfolk passively accept such behavior? After the recent BLM arrests, the San Juan County Sheriff contacted both of Utah U.S. senators, requesting a federal investigation. The investigation that he requested centered not on possible conspiracy to loot artifacts from our public lands. His main concern was that a phalanx of armed federal agents had arrested middle aged and elderly citizens of Blanding. Included in the arrests was a member of his family. Whether we agree with the tactics of federal agents or not, it is hard to argue against ending what had become rampant grave robbing and desecration of sacred sites. Whether the issue is overgrazing or pot hunting, only when we abandon our feelings of entitlement shall we begin to heal both our relationship with the land and with the spirit of the ancients. Read the latest Utah Stolen Artifacts Case News at MoabRockart.com.